Situated in a tropical garden paradise on the north coast of Bali, directly on the Bali seafront, you will find the 18 villas and 7 bungalows of the Holiway Garden, Resort and SPA. Coconut trees, mango and cashew trees offer a cool shade and lawns open the view to the sea. 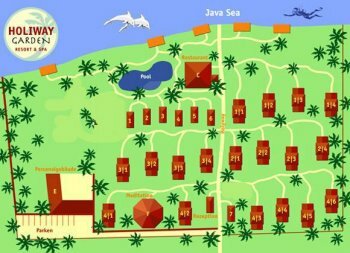 Designed and constructed according to Feng Shui and biological building aspects, the layout of this ECO resort reflects the highest possible level of privacy. The name „Holiway Garden“ is courtesy of the „Holy Path”, the “Jalan Suci”, which leads through the premises – a pathway over which a procession takes place one a year. “Holiway” also stands for a holistic way of life – life in holism. 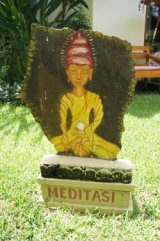 In this context we have a variety of interesting offers for your body, soul and mind – to bring you back into balance. Offering separate treatment rooms, the „Lotus-SPA“ contributes towards promising pure relaxation thus allowing to ease tension. On the other hand, the pool, the restaurant or a game of boules are ideal for laughing, making jokes and chatting! No one has to be alone, unless of course they want to be. In the following you´ll find some Photosfrom our last visit.